How Does Wavefront LASIK Work? What is the advantage of Blade-free LASIK surgery? Who are candidates for Blade-free LASIK surgery? Is 20/20 vision guaranteed with Blade-free LASIK? Is 20/20 vision guaranteed with LASIK? Wavefront Technology is the scientific base for Customized LASIK laser vision correction currently being performed today. Wavefront Technology has improved the visual outcomes of patients and provided significant advantages over conventional LASIK. Just like a fingerprint no two corneal maps are the same. 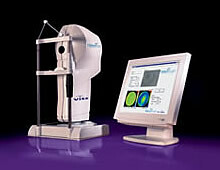 In the system's diagnostic phase, a device called the WaveScan makes a WavePrint Map, a detailed map of the patient's vision. In the treatment phase, the doctor uses the information from the WavePrint Map to perform the vision correction using the excimer laser. Wavefront technology was first developed in 1978 by Josef Bille, Ph.D., director of the Institute for Applied Physics at the University of Heidelberg, to measure Wavefront distortions that occurred when light traveling through the atmosphere entered a telescopic lens. This technology removed any visual distortion or aberrations from the atmosphere allowing astrophysicists to more accurately view images of the stars and planets. It is now possible to utilize this technology to record detailed information about the visual characteristics of the eye. Unlike standard measuring devices such as corneal topography, which measure the front surface of the eye called the cornea, the Wavefront scans the way the entire optical system processes light. Wavefront analysis works by measuring the distortion or irregularities of the eye, known as higher-order aberrations. When a ray of light first enters the eye, it passes through the cornea to the lens and vitreous, ultimately reaching the retina. As it bounces off the retina and returns back through the cornea, the Wavefront analysis detects and documents these distortions, which are unique to each individual. Because each patient has a unique visual optical system, the Wavefront data has been likened to a fingerprint. Once the Wavefront data has been documented for an individual patient, the next step is to use this information to utilize the excimer laser to correct the higher-order visual aberrations. The surgeon can then determine what adjustments must be made to the corneal surface to produce a clear, crisp image for the unique individual needs of each patient. The use of Wavefront technology to provide a more precise laser vision correction is known as "Custom LASIK" or "Wavefront-Driven LASIK". Early data suggests that the 5-10 percent of patients who demonstrate higher-order aberrations are the patients that will significantly benefit from Custom LASIK treatments. Other patients may benefit from Custom LASIK to a smaller degree.